Depending on your child's age they can travel free or enjoy reduced rate travel on public transport throughout London. This can really help keep costs down when visiting London as a family. Children over 5 can travel unaccompanied on London transport but it would be unusual to see young children traveling alone. Most primary school children in London (under 11s) are escorted to and from school by an adult (parent/carer). Check TfL's useful guide and route maps to learn more about traveling with children. 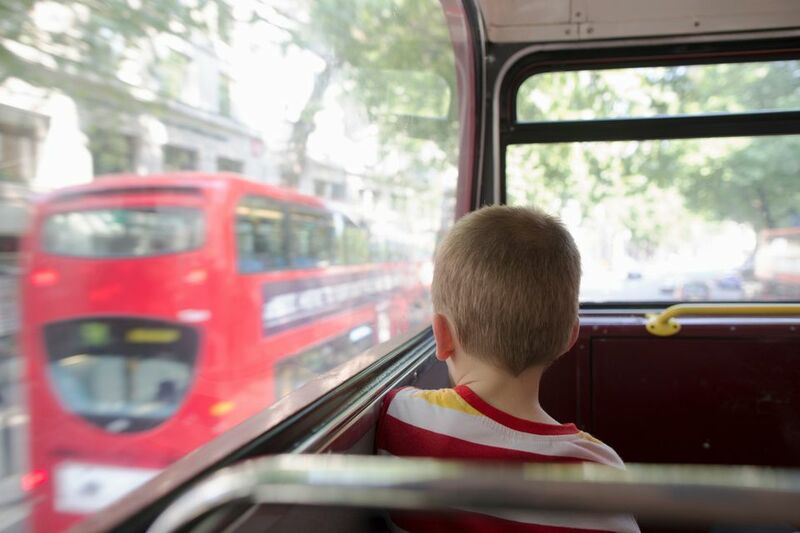 Children under 5 travel free at any time on London buses, the tube, trams, Docklands Light Railway (DLR), and London Overground trains when accompanied by an adult with a valid ticket. Children under 11 can travel free on the tube, DLR, Overground and TfL rail services when accompanied by an adult using pay as you go or with a valid ticket (up to four children can travel per adult). If children are traveling alone they'll need a 5-10 Zip Oyster Photocard in order to travel for free. If children do not have a valid Oyster photocard, they must pay the full adult fare on National Rail services. In order to apply for a 5-10 Oyster Photocard, a parent or guardian must create a web account and complete a form on behalf of the child. You'll need a color digital photo of the child and you'll need to pay a £10 admin fee. All 11-to-15-year-olds need an Oyster Photocard to travel free on buses and trams. They must also touch in/out (place their Oyster photocard on a reader to document the journey) as they board a bus or at the tram stop before boarding to avoid a penalty fare. 11-15-year-olds can travel off-peak on the tube, DLR, and London Overground for a maximum of £1.30 a day with an Oyster photocard. In order to apply for an 11-15 Oyster Photocard, a parent or guardian must create a web account and complete a form on behalf of the child. You'll need a color digital photo of the child and you'll need to pay a £15 admin fee. 16 to 18-year-olds who are in qualifying full-time education and live in a London borough can travel free on buses and trams with a 16+ Oyster Photocard. Other 16-17-year-olds can get a 16+ Oyster Photocard to travel at half the adult rate. In order to apply for a 16+ Oyster Photocard, a parent or guardian must create a web account and complete a form on behalf of the child. You'll need a color digital photo of the child and you'll need to pay a £20 admin fee. Applications can be made in advance for a 5-10, 11-15 and 16+ photocards for collection on arrival in London. Visitors can apply online or ask for an application form to be sent to you. You need to apply at least 3 weeks in advance or you can simply sort it out when you arrive at any London Underground station. Be sure to bring some passport size photos. Students aged 18 and over attending a full-time course at a university, college, or school should contact their education provider to see if they are registered with the 18+ Student Oyster photocard scheme. This allows the purchase of Travelcards and Bus Pass season tickets at 30% off the adult rate.